Back in February I made a massive batch of Kerryann’s hidden vegetable pasta sauce, most of which I stuck in the freezer and thawed periodically to make spaghetti, lasagna, and pizza. We ran out near the start of the summer, at which point I decided to try to perfect my own tomato sauce recipe. Don’t get me wrong, I adored the flavour of Kerryann’s, but I never got over the weird brownish-green that my attempts at the recipe ended up. I think that my previous suspicious were correct and that’s just because the proportions of fruits and vegetables are different here in Canada than they are in Britain, from whence the recipe originates. Right now my little garden is yielding about 6lbs of tomatoes (mostly cherry tomatoes) every four or five days, so I need to keep up with the harvest. For example, Kerryann’s recipe calls for eggplants (or rather, aubergines), among other ingredients. 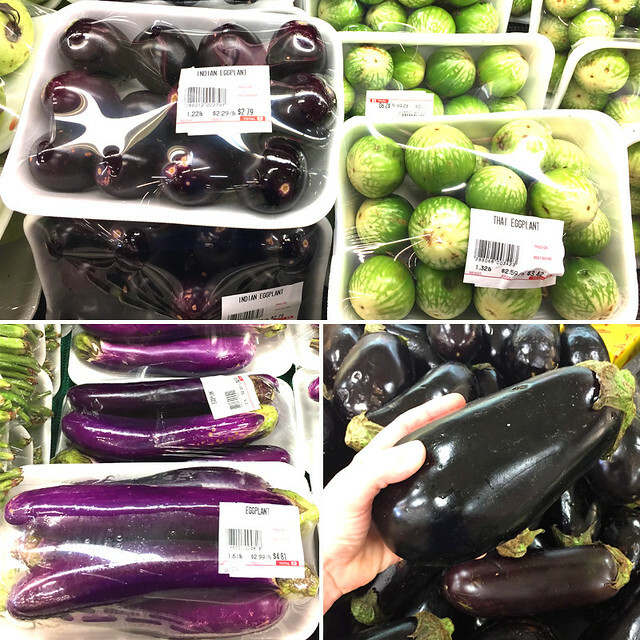 In my local grocery store, which does not specialize in particular kinds of produce, I was able to find four kinds of eggplant, all of which are extremely different sizes. So what is considered a “medium aubergine” in Britain? The video helps narrow the criteria down a bit, but I think that the produce here is just bigger. (I know that our leeks are freaking enormous.) Canada is a country that is very driven by agriculture, after all. There were some other problems with importing this recipe. I’ve never found tomato puree in tubes here, although canned tomato paste is commonplace. I’m not sure if substituting the latter for the former would effect the colour or flavour, as I can’t get my hands on the kind in tubes to compare. I also had a hard time finding sieved tomatoes (passata), although it’s possible to find cans with tomatoes that have been crushed, small cut, diced, diced with herbs, left whole, stewed, or preserved without added salt. So I’ve made my own tomato sauce recipe with added vegetables. I’ve measured everything out by weight, which should mean that this recipe will come out more or less the same no matter how big your local vegetables grow. I’ve left out the leeks and the celery, as well as peeled the eggplant and the zucchini, which should correct the colour of the sauce. Last but not least, I run my sauce through a blender after it is all cooked so that it is all the same consistency, which is perfect for sneaking veggies into the diets of picky eaters (a lot of people have problems with textures more than they do with flavours). Tomato sauce simmering on the stove. Cook on medium heat until onions have started to turn clear. Do not brown. Cover and cook on medium heat until carrots are softened. Stir often to avoid browning. While this mixture is cooking, prepare tomatoes. 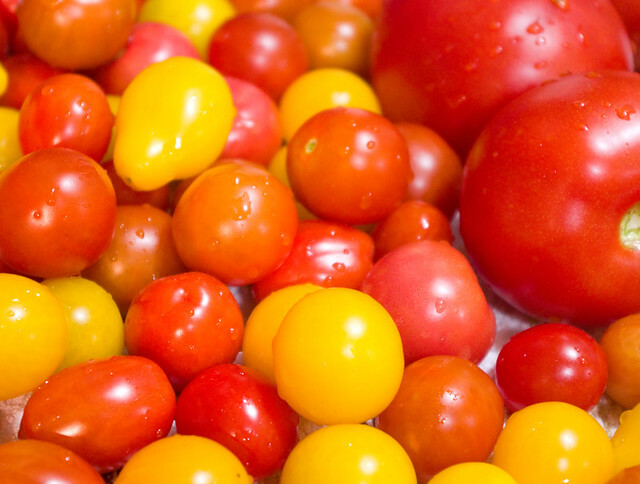 If using cherry tomatoes, cut each one in half. If using larger tomatoes, remove the piths and quarter them. Pour cooked mixture into a deep pot, such as a stock pot. A heavy-bottomed pot is best, but if one isn’t available, any large pot will do. If a thinner-bottomed pot is used, it will have to be stirred more frequently to prevent sticking & scorching. Slowly bring mixture up to a boil, then turn the burner down until it is just simmering. Stir frequently to prevent scorching. Sauce is cooked once all of the ingredients are soft, the last of which should be the tomato skins. Turn off the heat under the pot. Carefully ladle the hot sauce mixture into a blender to at most 3/4 full, put the lid on the blender, put a towel over the lid, and blend until smooth. Be careful, as the mixture is very hot! 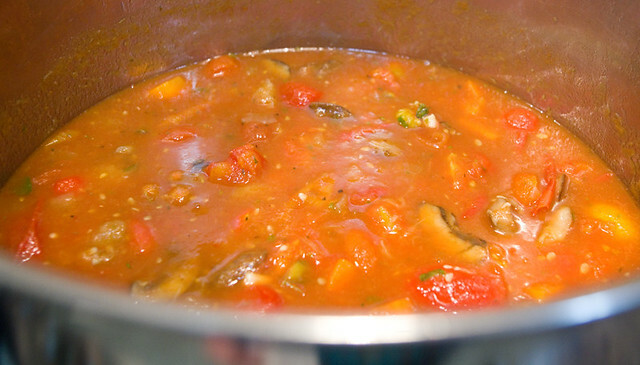 Pour the blended sauce into a large bowl or pot, then repeat until all of the sauce is blended. At this point the sauce may be completely done, or it may be a little bit too liquid, depending on the juiciness of the tomatoes used. If the sauce is watery, return it to the deep pot and simmer gently until it has reached the preferred consistency, stirring often. *Yellow zucchini is preferred to contribute to the colour of the sauce, but green zucchini will taste the same if that is what’s available. 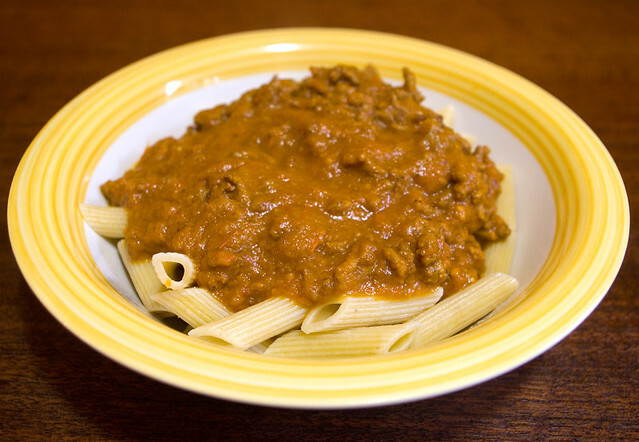 Tomato sauce with ground beef over penne. Healthy veggie tomato sauce can be served as-is over pasta; spaghetti is most commonly used, although in our house we prefer penne. If you use vegetable broth instead of chicken broth when you make the sauce, this results in a vegetarian/vegan dish. However, I like to freeze it in dinner-sized portions, then thaw it while I fry up and drain a 500g package of lean ground beef, turkey, meatballs, or sausage. I stir the sauce in with the meat and simmer together while the pasta boils for an easy weeknight dinner. This tomato sauce is also great for making homemade lasagna, pizza, or Sloppy Joes. 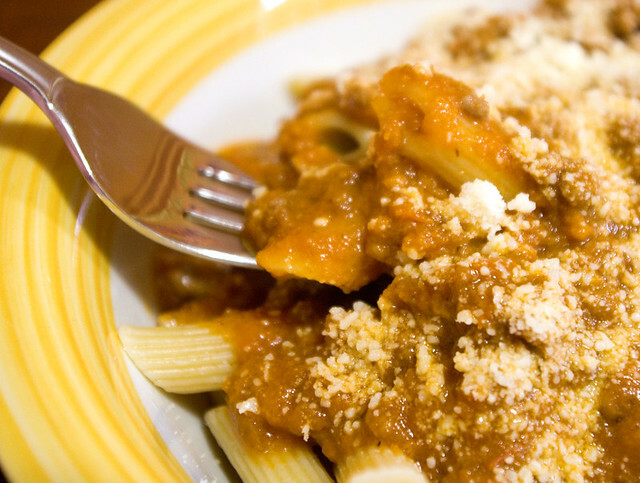 Tomato sauce with ground beef over penne, sprinkled with Parmesan cheese. Posted on September 4, 2017 September 4, 2017 by owntwohandsblogPosted in Cooking, Gardening, RecipesTagged Cooking, food, homegrown, homemade, pasta, recipe, sauce, tomatoes, vegan, vegetables, vegetarian.